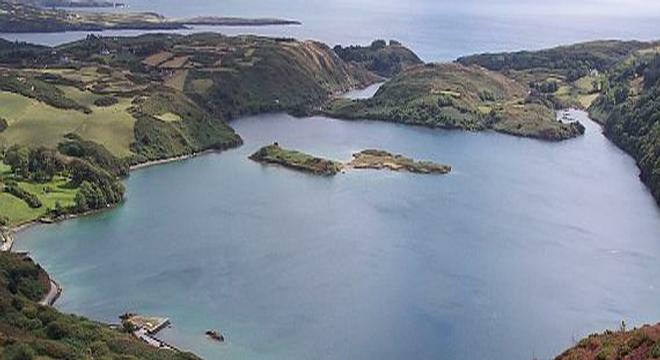 Ireland's first Marine Nature Reserve and unique sea-water lake, Lough Hyne is one of the most beautiful spots in West Cork and offers diving and water sports opportunities. Nestling within a fold of hills 5km away from the market town of Skibbereen, Lough Hyne is a place of peaceful serenity, steeped in local folklore and home to a unique ecosystem. Just 1km long and 3/4km wide, this marine lake is connected to the Atlantic Ocean via Barloge Creek, by a narrow tidal channel, known as the Rapids. Tidal flows from the Atlantic fill Lough Hyne twice a day, running over the Rapids at up to 16km per hour, and create in the lake a unique habitat of warm oxygenated seawater, which sustains a huge variety of marine plants and animals including 72 species of fish. Lough Hyne is one of the most important marine habitats in Europe and was made Ireland's first Marine Nature Conservation Reserve. Above the narrow rapids is a promontory on which stands the ruins of an 8th Century church to St Brigid which was in regular use in the Penal times when Catholics, barred from practicing their religion would hold mass in such hidden away secret places. Beside the church is an early inscribed cross and St Brigid's Well, where it is said the knees of the saint have made impressions in the rocks. In the centre of the lake is Castle Island on which stand the ancient ruins of Cloghan Castle, once a stronghold of the O'Driscolls. According to local folklore here lived King Labhra Loinseach, who had asses ears, a tall tale that any Irish child will tell you! A climb up Mount Knockoumah rewards with stunning views down into Lough Hyne and out to the Atlantic Ocean. The Lough Hyne Visitor Centre is situated at the Skibbereen Heritage Centre, in the town close by. For more information on our Ireland vacations or group tours to Ireland contact us.